At another school, students start their day by meeting with local mentors over breakfast. During third period, a student must be excused for her annual checkup, but instead of leaving school to go to the doctor, she sees a pediatrician at the school-based health clinic and then returns to class. When the traditional school day ends, a dozen volunteers come to the school to lead after-school activities that students have asked for, including robotics, music, and athletics. Later that evening, students and their parents come to the school for a regularly scheduled community dinner provided by the district, where teachers are on hand to help students with homework, and parents receive guidance on registering for health insurance and connecting to needed social services. The second school is a community school, one of a growing number of schools that provide both the familiar K-12 curriculum and a much broader range of supports to students and families — high-quality academic instruction, and mentoring, health care, college and career counseling, financial advising, and much more. In many cases, the community school serves as a neighborhood hub, bringing together educators, families, business leaders, elected officials, and many other local partners to ensure that students have real opportunities to succeed in school and in life. At a time when federal policy makers are rightfully asking local educators and elected officials to take more ownership for how schools operate, community schools are becoming more important than ever. After two decades, the education reform pendulum has finally begun to swing away from the no-excuses world view. Today, the public understands that students need a variety of supports — academic and nonacademic — to help them learn. As the 2017 PDK Poll of the Public’s Attitudes Toward the Public Schools revealed, 77% of Americans strongly support after-school services, 76% strongly support providing mental health services at school, and nearly two-thirds strongly support providing health services. Clearly, the public believes in the commonsense strategies that are core to the community schools approach. Community schools are a contemporary approach built on more than 100 years of experience. Their roots lie in the teachings of John Dewey, the great education philosopher who believed that schools should be centers of community life, and learning should be relevant, helping young people address the real-world problems that face them, their families, and their neighbors. Their roots lie also in the caring practices of the social reformer Jane Addams, whose 19th- and early 20th-century settlement houses were designed to help immigrants and the poor gain solid footing so they could contribute to the country’s prosperity. In the past century and up until the late 1970s, many of the functional services of community schools were publicly funded via federal initiatives including affirmative action, bilingual education, Medicaid and Medicare, low-income and public housing, social security, unemployment, food stamps, and programs to place case managers, social workers, and nurses in the schools. These foundational services, whose roots were nurtured by the community organizers of the 1960s, helped level the playing field so American schools became the greatest in the world. But fast-forward to the year 2000, and most of these foundational services had been eviscerated in favor of broad tax cuts, and the public and political will to serve all children (particularly low-income children of color) had nearly vanished. The community school is the hub of the neighborhood, uniting educators, community partners, and families to provide all students with opportunities to succeed in school and in life. Community schools today are a historical return to the notion of school as the center for community life. They are hyperlocal institutions where neighbors, students, faith-based leaders, teachers, principals, school district officials, and parents can come together to share their concerns and aspirations, combine their resources, and find effective and sustainable ways to respond to challenges such as neighborhood violence, hunger, housing shortages, and environmental pollution. Further, community schools tend to be valuable partners to local businesses, joining with them to create student internship and job training opportunities and workforce development programs. 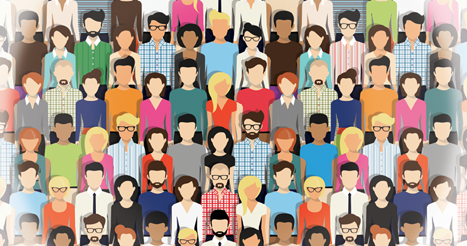 Every school — whether urban, suburban, or rural — can become a community school. And increasingly, school and community leaders across the country are stepping up and saying they want their schools to operate this way. We used to say that no two community schools are the same, given that their programs and services differ from building to building and from neighborhood to neighborhood. 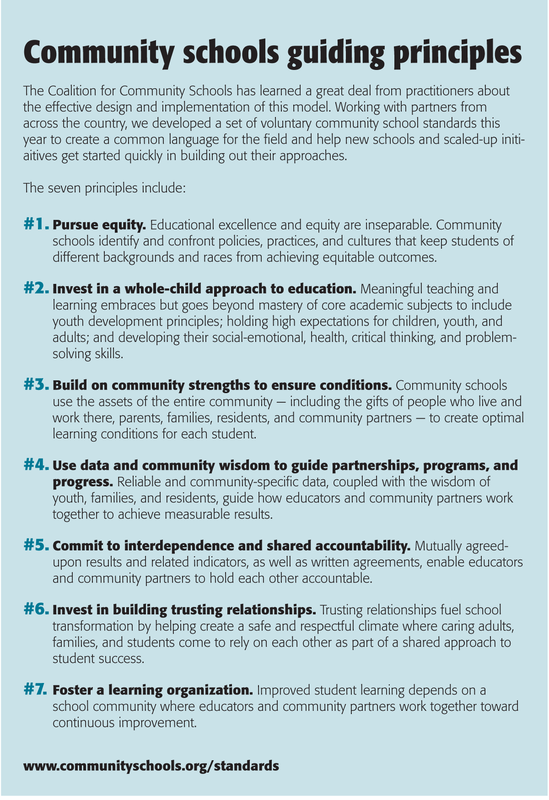 Over the past 15 years, however, we’ve learned a lot about how community schools operate, and research has pointed to some fundamental practices and principles that all effective community schools have in common and that get results when they are well-implemented. So what does a community school require? Every community school should start by asking local students and their families what needs to happen so students can succeed in school and graduate ready for college, careers, and citizenship. Depending on how they answer this fundamental question, they may choose to focus on any number of priorities, such as ensuring that young children are ready to learn, improving student attendance, strengthening family involvement in the school, promoting physical and mental health, or providing opportunities for academic enrichment. The specific programs and services they choose to offer will depend on the local context, but the guiding principle should always be to start by identifying students’ most critical needs and strongest assets and then bringing together the programs, partners, and resources necessary to meet them. Every community school should also be committed to building equitable and trusting relationships with their many stakeholders. No school can succeed for long without doing so, but, especially for community schools, success depends on the quality of the relationships that school and district staff maintain with various partners, including teachers, counselors, social workers, parents, clergy, elected officials, business leaders, volunteer tutors, and others. They must understand themselves to be providing services with people, not to them. Thus, community schools assemble a leadership team that embraces students, families, and other partners and includes them in the decision-making process. Further, and unlike other schools, community schools and their partners share accountability for student and community outcomes — and, again, this requires that partners have a seat at the table when important decisions are made. When the community has greater ownership over its schools, people are more likely to trust them and less likely to move from reform to reform, program to program, and partner to partner. Finally, community schools are distinct in that their senior-level administration typically includes a site coordinator (sometimes called a community school director or site manager), who works hand in hand with the principal, other school staff, partners, and the broader leadership team to manage the process of identifying needs, locating resources, implementing programs, and assessing their impact. Measure effects and outcomes so the school, partners, and families can stay focused on the results they seek and make adjustments as necessary. The opportunities provided by community schools can be grouped into three broad areas: powerful learning, integrated health and social supports, and authentic family and community engagement. First and foremost, community schools are schools that are dedicated to effective teaching and learning. Thanks to help from community partners and volunteers, a lot of meaningful, authentic, and challenging learning opportunities occur during and outside of the regular school day (including tutoring sessions, after-school and summer programs, social-emotional learning, business internships, musical performances, and more). Second, most community schools provide a mix of social services and supports, commonly known as wraparound services, that address student needs related to physical and mental health, housing, nutrition, and much more. Simply put, succeeding in school is hard when one is hungry, homeless, or needs glasses. Rather than dismissing such conditions as mere excuses, community schools recognize that they present significant barriers to learning, and they remove them while also maintaining a focus on powerful learning. Third, because families are the primary source of support for children’s learning and development, community schools prioritize reaching out to parents and other family members to see what resources they need — from books to visiting nurse programs to mobile libraries and workforce development opportunities — and encourage them to be involved in the life of the school. The more they engage with the adults in the neighborhood, the more community schools can do to address local civic and educational needs. A growing body of research findings suggests that community schools work. For example, recent reports from the National Education Policy Center and the Learning Policy Institute (Oakes, Maier, & Daniel, 2017; Maier et al., 2017) offer the most comprehensive review of the research to date. 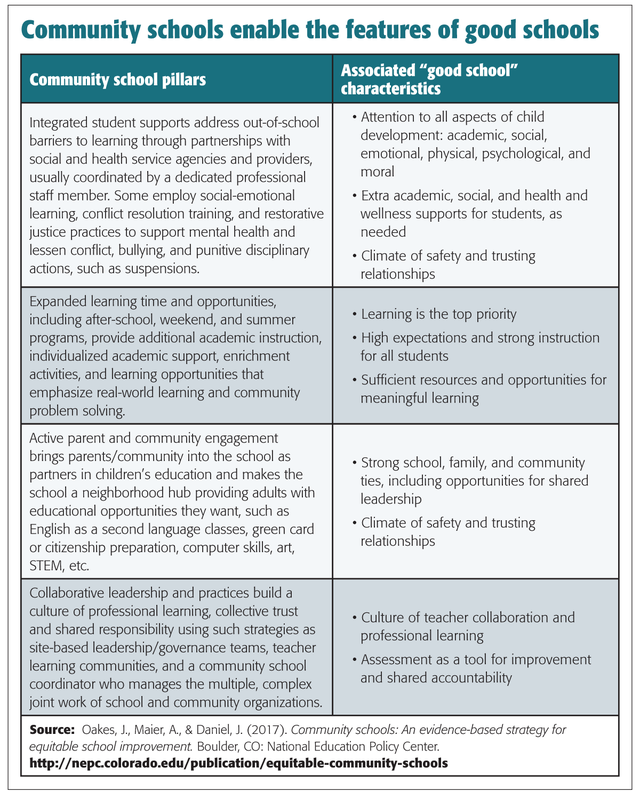 Having surveyed the available evidence about community schools’ outcomes — as well as evidence on component parts of the model, such as integrated student supports, expanded learning time, family and community engagement, and collaborative leadership — the authors argue that community schools are an evidence-based strategy that education leaders and policy makers should support. They find that community schools can help improve attendance, reduce the dropout rate, and close the achievement gap. For example, in Baltimore, 77% of community school students in grades 6 to 8 were less likely to be chronically absent than a control group. In Tulsa, students in high-implementing community schools outperformed noncommunity schools in math by 32 points and reading by 19 points. Research also suggests that community schools are a good investment of public dollars and offer a strong social return on investment. Also significant, we find that community schools are an education reform strategy that is built to last, in that they rely on partnerships that live on after individual leaders depart or funding sources change. When the community has greater ownership over its schools, people are more likely to trust them and less likely to move from reform to reform, program to program, and partner to partner. Community schools are a viable way to promote equity as well. They focus especially on relying on the wisdom and assets of the most vulnerable students and families while providing opportunities, services, and supports at the time they are needed. Community schools are found in urban areas from Tulsa to Oakland, from Chicago to Salt Lake City, from Austin to Grand Rapids. They are also growing in inner-ring suburbs and rural areas, from Montgomery County in suburban Washington, D.C., to Broome County, N.Y., in rural upstate New York. Finally, community schools can be designed and launched by just about anyone with the will to marshal local community resources on behalf of students and families. Successful initiatives have been created by organizations as varied as school districts, United Ways, universities, funders, local governments, and other community-based organizations. Across the country, the number of community schools continues to grow, as local educators, community leaders, and others look for equitable, efficient, and effective ways to provide the broad range of supports and services that allow young people to become truly well-prepared to enter college or a career. The Coalition for Community Schools counts at least 5,000 community schools nationwide, has helped organize 15 state-level coalitions for community schools, and is the national intermediary for our local, state, and national partners. Moreover, with the recent passage of the federal Every Student Succeeds Act, states, cities, and towns have an important new opportunity to rethink how they want schools to function. In particular, do they want them to continue to be stand-alone institutions that meet only a portion of students’ needs? Or are they ready to build more dynamic and supportive partnerships among schools, families, and other local stakeholders? The community schools movement offers a commonsense, nonpartisan, and very promising way to bring together programs and partners to make a lasting effect in their communities. Originally published in February 2018 Phi Delta Kappan 99 (5), 8-14. © 2018 Phi Delta Kappa International. All rights reserved. REUBEN JACOBSON (jacobsonr@iel.org) is deputy director of the Coalition for Community Schools, Washington, D.C.
LISA VILLARREAL is CEO of Youth Ventures Joint Powers Authority, Oakland, Calif., and chair of the Coalition for Community Schools Steering Committee. JOSÉ MUÑOZ is director of the Coalition for Community Schools, Washington, D.C.
ROBERT MAHAFFEY is executive director, Rural School and Community Trust, Washington, D.C., and vice-chair of the Coalition for Community Schools Steering Committee. As someone who spent a lot of time evaluating the first wave of community school models here in Chicago, I am excited to see the progress in conceptualizing the workings and impacts of community schools in ways that articulate to the broader conversation about data-informed school improvement. Congratulations to the authors and the community school advocacy community. You don’t focus on how you bring about Community Schools and where does the leadership come from. Is there not a need for a Comm. Schools coordinato? Who can make this happen?. In our fast paced world with nuclear families, I believe community schools are our missing link for the future.